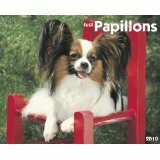 I have 14 Papillons (I breed and show... ages 9 months to 14 years). Two of the dogs sleep on my bed, the rest sleep in their crates. They used to sleep for a good 7 hours at night, but for the last year they have been wanting up earlier and earlier. I think some of the problem may be that I suffer from chronic pain and as a result don't always sleep well at night myself....so often spend part of the night in my recliner in the living room. The average night's sleep around here is now 3 to 3 1/2 hours, at which time they start howling. I can't ignore them since I live in a duplex and have very close neighbours on the other side and I'm sure it's enough noise to wake everyone. After I let the dogs out of their crates - can't let them outside at 5 in the morning, so I use washable pee pads for them to relieve themselves - if I go back to bed, they will go frantic at the bedroom door. But they don't seem to object if I crash in the living room in the recliner. I can usually manage to get a couple more hours sleep, at which time it's late enough to let them outside for a while.....but would like to have the option of spending 7 or 8 hours per night in bed (when my pain level isn't out of control). Help please....I just don't know what to do! Dog insomnia can be a real problem, especially when it is causing you to lose so much sleep. circumstances remain constant and the same routine is followed every day. If things change, they may take a while to adapt, but eventually they will settle down again. Even stressful things that may be happening during the day can cause dogs to have insomnia at night. However, if these are not issues, I am thinking that your dogs may need more activity to get them really tired out. Perhaps someone in the family could take them for a longer walk in the evening or play some games of fetch with them at the local park. Dogs as small as the Papillon should get tired after retrieving a ball, or other toy, for a short while in the evening. You could even have someone play fetch games with the dogs at home using a soft ball to toss across the room until the dogs start to run out of steam. Also, try to keep them from resting up too much during the day! Another thought is about their eating schedule. Are they eating or drinking too close to bed time? If so, this is likely to keep them active during the night. On the other hand, if they are fed early this will allow sufficient time for digestion and a potty trip outside before bedtime. In regard to the recliner, since your dogs don't seem to make a fuss when you're using it to rest, why not move it to the bedroom. Then if you need to get up from bed to rest in the recliner for a while, they may not feel disturbed by your movements. getting a touch of arthritis that wakes them during the night. A visit to the vet for a checkup might be in order to rule out any health related causes. If you do visit or call your vet, ask him about using calming herbs such as valerian or kava kava. If after trying any of the above, there is no change, then it might be necessary to ignore their howling for a few nights in order to break the pattern. If you explained what you are doing with your neighbors, maybe they would be sympathetic enough to agree to wear earplugs during this time? One last approach that some owners have used to discourage unwanted behavior: Give them a spray of water from a spray bottle, along with a "quiet" command, when they start howling. This may be worth a try, especially since it's quite a gentle reminder!